Let’s Move Our 50 States Toward Clean Energy! 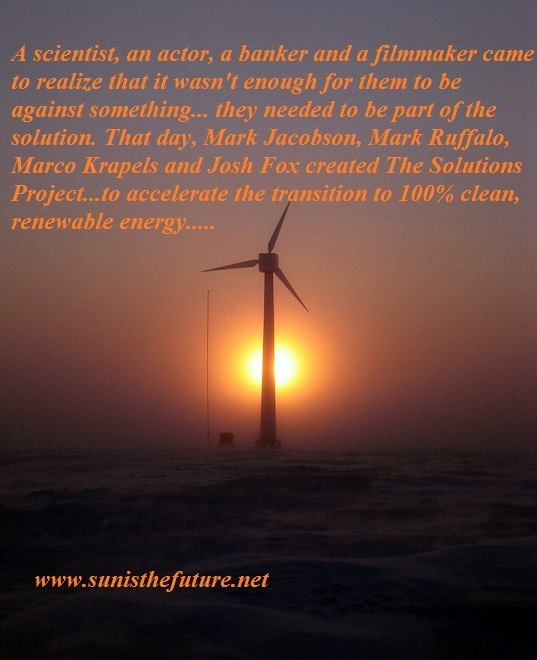 The Clean, Renewable Energy Movement Is Here! According to Professor/Dr. Jacobson, the motivation for this 50-state plan is to address the negative impacts on climate and human health from widespread use of coal, oil, and natural gas. “Drastic problems require drastic and immediate solutions….Global warming, air pollution, and energy security are three of the most significant problems facing the world today,” commented Dr. Jacobson, a professor of civil and environmental engineering, “Our new roadmap is designed to provide each state a first step toward a renewable future.” Conversion of energy infrastructures of New York, California, and Washington states to 100% clean energy (composed of solar-wind-water power) by 2050 have been developed by Jacobson and his colleagues, with an online interactive map tailored to maximize the renewable resource potential of each of the 50 states. For example, as one hovers a cursor over region of CA on the map, one sees that CA can meet almost all of its power demands (transportation, electricity, heating, etc.) in 2050 by a clean energy portfolio composed of 55% solar, 35.5% wind (on-and offshore), 5% geothermal, and 4% hydroelectric, and 0.5% wave power. Florida, on the other hand, will be meeting its power demands by 77.9% solar, 21% wind, 1% wave device, and 0.1% hydroelectric power by 2050. Nuclear power, ethanol, and other biofuels are not included in the energy mix of any of the 50 states by 2050. The goal of The Solutions Project is in combining science, business, policy, outreaching through social media and artists and entertainers who can facilitate in circulating the information among general public, and in researching for solutions to these global challenges. The goal of The Solutions Project is definitely in sync with that of Sun Is The Future…spreading the information about solar energy (www.sunisthefuture.net), helping entrepreneurs to establish small businesses in solar energy/renewable energy/energy efficiency/recycling (www.kiva.org/team/sunisthefuture), and operating online store (www.sunisthefuture.com). Let’s join The Solutions Project and sign up to support the movement of your/our respective states’ Transition Toward Clean Energy! Fellow Earthlings, We Need To Go Renewables (Solar-Wind-Water) Quickly! Do You Want Energy Independence or Our Democracy to Return To Us?